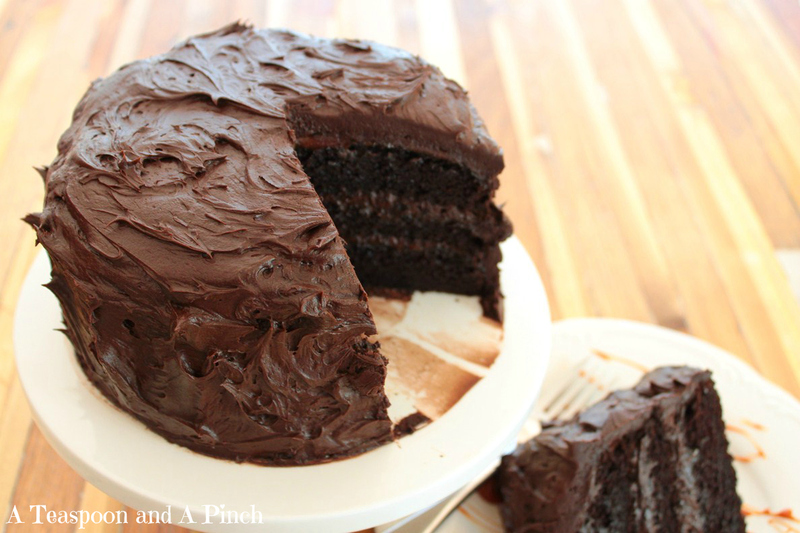 - I made the cake and frosting with Hershey's Special Dark baking cocoa. But both were created for regular baking cocoa, so feel free to swap out the dark cocoa for regular. 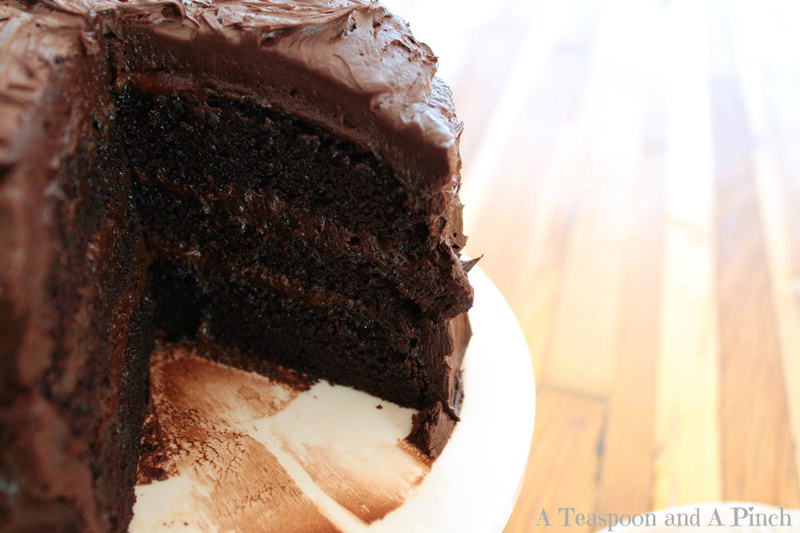 - The cake and frosting recipes were written for three 6" layers. If you want to make three regular 9" layers, just double the cake recipe, and make about 1.5 times the frosting. 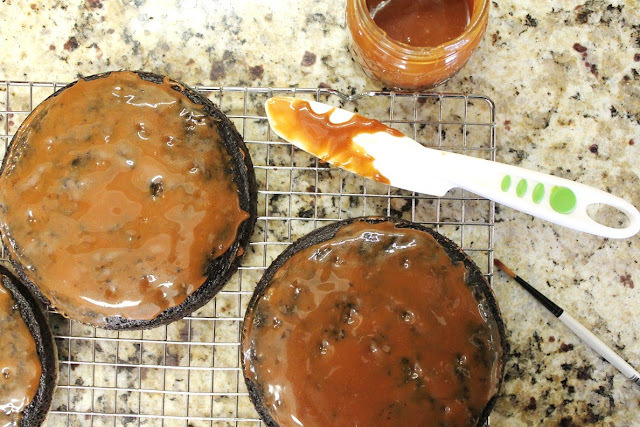 - The caramel sauce recipe is from an older post of mine. Definitely go there for more photos of the caramel process. But you could also buy caramel sauce from the store and skip the extra steps. - If you want to make things in advance, you can definitely whip up the caramel a few days ahead. Just reheat in order to pour over the cake layers. 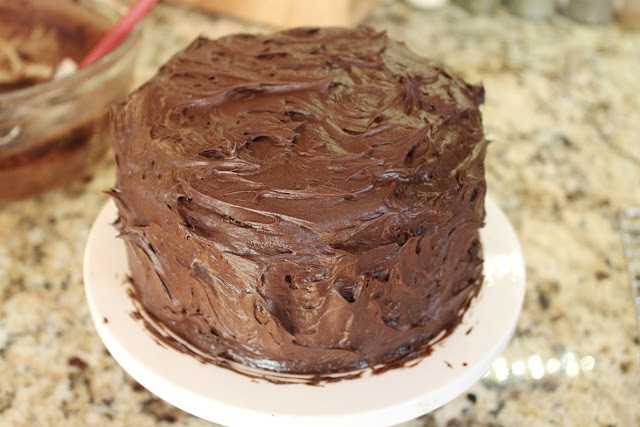 The frosting can also be made ahead by a few days; let it come to room temp before spreading onto the cake. Preheat oven to 350 degrees. Line the bottoms of three 6" round cake pans with parchment paper, and then lightly spray the parchment and sides of the pans with nonstick spray. 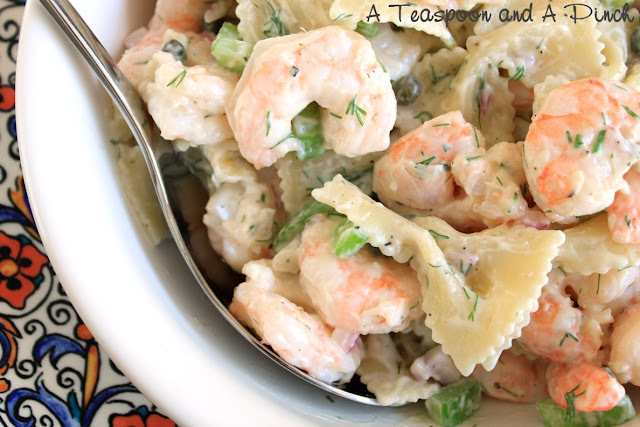 In a large bowl, whisk together all dry ingredients. Set aside. In a separate medium bowl, whisk together the buttermilk, oil, egg, and vanilla. Slowly add the wet ingredients to the dry ingredients, and beat until combined. Slowly mix in the hot coffee; the batter will be very thin. Distribute batter between the three pans (approx 235g batter in each). 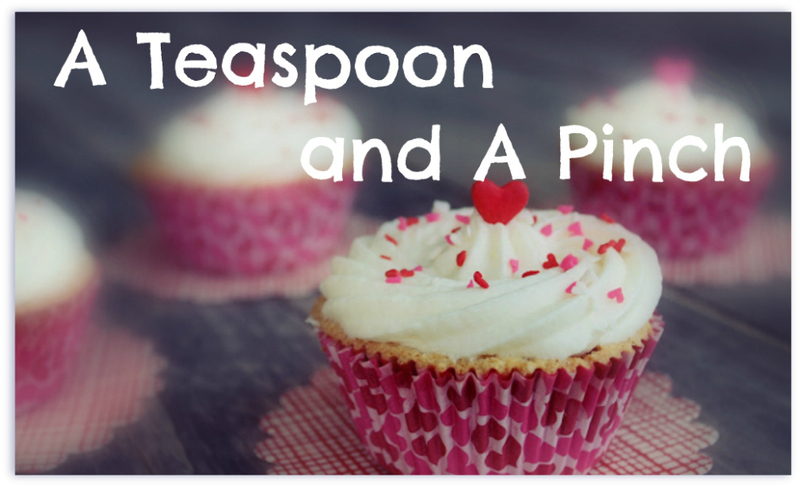 Bake for 22-25 minutes, until cakes pass the toothpick test. (Meanwhile, make the caramel sauce.) Cool in pans for 10 minutes and then turn out onto cooling rack. 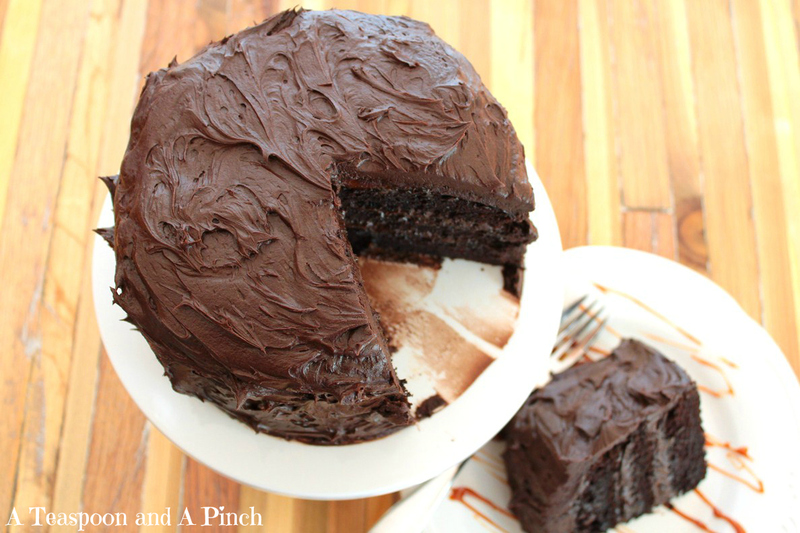 Poke holes into warm cake layers with a chopstick or similar. Pour 2-4 Tbsp. warm caramel sauce over each layer, smoothing to the edges and filling holes. 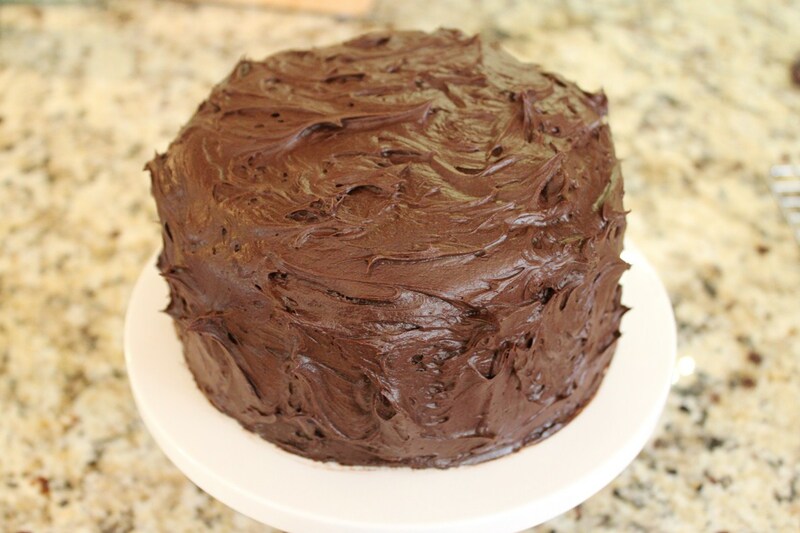 Allow cake layers to finish cooling on rack, then refrigerate until ready to frost. Measure out the heavy cream in a liquid measuring cup and add vanilla. Microwave for one minute and set aside. Spread the sugar in an even layer over the bottom of a large, heavy-bottomed saucepan. Place over medium-low heat (dial set to 3 on my stove), watching carefully. When the sugar begins to liquify around the edges, swirl the saucepan to stir the sugar towards the center. Continue watching and swirling very gently until all the sugar is melted, taking care not to allow sugar to clump up. Once the caramelized sugar reaches a deep amber color, immediately remove the sauce pan from the heat. Carefully and quickly, stir in half of the hot cream. The mixture will steam and bubble violently. Stir until the cream is well incorporated, then stir in the remaining cream. Stir in the salt and optional butter. If any sugar has hardened, place the saucepan over low heat and whisk until smooth. 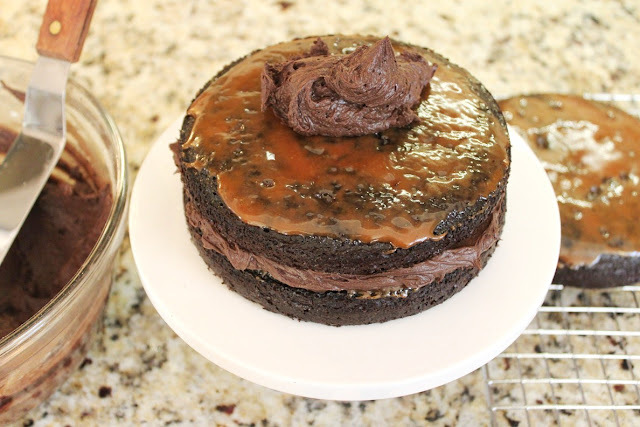 Store any leftover caramel sauce in the refrigerator. If needed, it can be rewarmed in the microwave or in a saucepan over low heat. Makes 3/4 cup. In a medium bowl, whisk together the confectioners' sugar and cocoa, and set aside. In a large bowl, cream butter until smooth, then gradually beat in cocoa. Beat in half the cream, until combined. Then beat in powdered sugar alternately with remaining cream. Add vanilla and beat until light and fluffy. If necessary, adjust consistency with more milk or sugar. Poke holes in the warm cake layers with a chopstick or a paintbrush handle. Then, spread warm caramel over the layers, making sure to fill the holes. Spread about 1/2 c. of the buttercream over cooled and chilled cake layer. 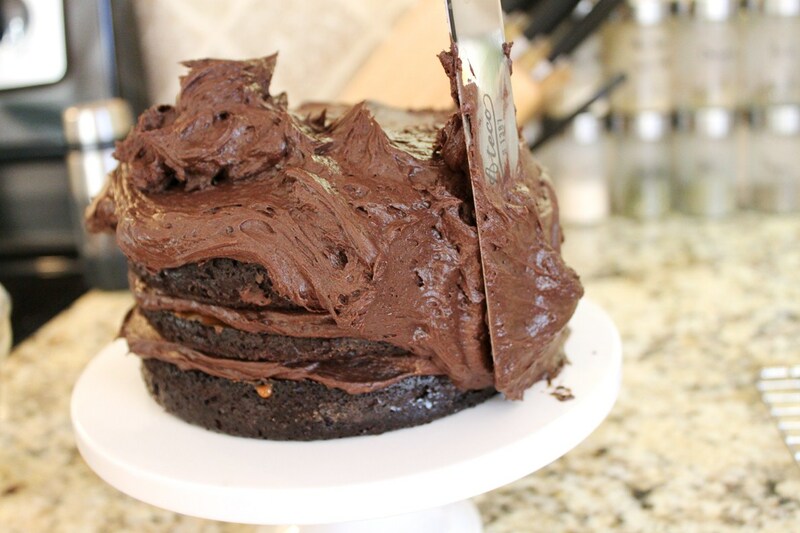 Spread frosting to edges and repeat with another cake layer. to the edges and then down the sides of the assembled cake. See the rough edge of frosting along the line between the bottom cake layer and the plate? Carefully wipe it clean with a paper towel or rag (or your finger, I won't tell). I'm teaching class right now and I put this up on the screen and everyone started drooling. So...when you get a chance, you're supposed to come up here to North Dakota and make several of these cakes for everyone. And one just for me, thanks!! Looks awesome! Where in Ohio? We are in Cincy, and it is very rainy... Have a nice trip! Akron. Sposed to get slushy tonight here!